Popular for its double flowers, Wisteria floribunda Black Dragon (also known as Wisteria floribunda Violacea Plena) has violet purple, pea-like double flowers that hang on long racemes in summer. Pinnate foliage emerges bronze in spring, maturing to bright green then buttery yellow in autumn. Ideal for growing against a wall or over a pergola, Wisteria Black Dragon can grow to 10 x 4 metres in 20 years and prefers moist but well drained soil and a position in full sun, though dappled shade will be tolerated. 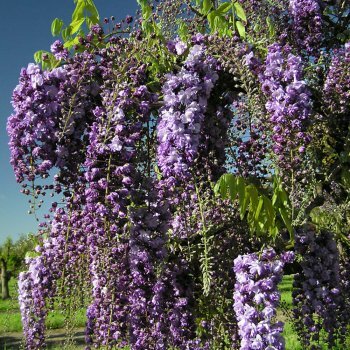 This Double Purple Wisteria plant is a beautiful variety, offering great seasonal interest. All our Wisteria are grafted (rather than cuttings) so ought to flower earlier. Our pot grown Double Purple Wisteria can be planted at any time of the year. Start by removing all weeds and grass within a metre of your intended planting hole, which is ideally next to something the Wisteria can climb up. Dig a square hole as deep as your root mass and approximately 2x as wide. To help your tree establish more effectively, especially if you have poor soil, we advise sprinkling root grow in the hole. If you’re planting in spring, summer or dry weather, water well and regularly for the first few months. Make sure to keep an eye on young Double Purple Wisteria and increase watering if there are extended periods of hot or dry weather. If you’re planting in autumn, you may only need to water your tree a little. We stock a range of irrigation kits, suitable for a variety of planting schemes. Wisteria plants have a reputation for being high maintenance when it comes to pruning, but this is not the case! When pruned at the correct times, Wisteria is easy to control and a pleasure for everybody. Wisteria floribunda Violacea Plena needs to be pruned twice a year. - in July or August and then again in January or February. In summer, after flowering, prune the green, whippy shoots from the previous year’s growth. This encourages flower production and helps to control the overall size. In January, remove up to half of the previous year’s growth, leaving just a few buds on each stem.